The robe is great quality. My grandson loves it. Exceptional quality meets unparalleled charm in this delightful kid-sized bath robe. Made from 100-percent premium Turkish cotton terrycloth, this hooded robe comes in a solid navy blue color that incorporates a white monogrammed letter of your choice. Soft and plush, with just the right amount of weight, this robe is the perfect gift for that special little one in your life. I ordered this robe for my daughter a couple of years ago and it is still in great condition after washes. The color is still a dark navy blue and it's just a robe of choice for me. I need to find this same quality robe in adult sizes. I purchased this for my 9-year old daughter who is a swimmer, she likes a cozy robe for when she gets out of the pool and this is perfect. It is very soft and the blue is a beautiful color. She is in love with it! Kids loved them and the color was perfect! Best first robe for my little one. Good quality and keeps him warm. Very good quality towel material, heavy in a good way, color is bright and clean. I ordered a large for my 5 year old and it reaches her ankles. I preferred this so there is room for her to grow. I love this robe because my daughter can brush her teeth while nice and warm right after a bath. I didn't necessarily get the robe on sale but still think it was a good investment. Hard to find a bathrobe for older kids and this is the perfect type - nothing gimmicky and in good quality terry cotton for drying. Wish I could find it without the monogram because it's one thing that doesn't pass down well when it has it. Our nine year old wanted to be warm after his bath. 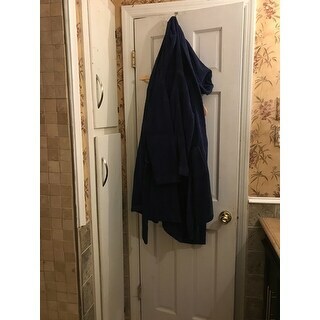 So we keep this robe hanging in the bath room for him. He usually puts it on after quickly toweling so it has to be dried but no problem. It’s been very useful and is comfortable and very nice navy heavy material, well made with pockets snd a self-tie belt. It also has his initial on the left upper side, really cute. These robes were fantastic, a little large for the smaller child, but the material is warm, they are of good quality, perfect for just getting out the bath or shower. The monogram adds a special touch. I would buy again. Adorable! Great quality, thick and soft. Monogram stitching was perfect! 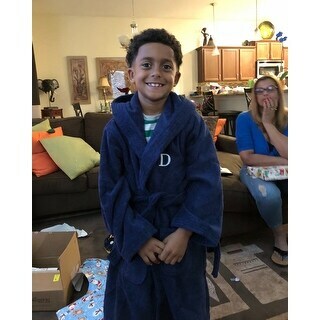 The robe fit my grandson perfectly. He loves it. The only draw back was, you can't choose the letter on the front. Other than that, it was a hit with the grand boy. He likes it because it is thick and warm like a blanket with sleeves. I know my great nephew will like this for Christmas. My order came on time and was wrapped nice and seems to be good quality. This is a soft and thick. My two grandsons have a tendency to take off running after their bath with towels dragging behind them. I love these robes. Great quality. Exactly what we were looking for! I just love this robe!! Bought it for Christmas for my grandson, he will love it as well!! "I need a large with initial C. Site only shows through small V. Are there any larges left?" Only the sizes listed are available. "What size should i order for a three year old"
The Small(Ages 5/6) meauseres 12.5 inches wide shoulder to shoulder x 29.5 inches long, Sleeve length: 17 inches. "I DON'T UNDERSTAND THE SIZE TO ORDER....EVERYTHING SAYS LARGE AND THEN A LETTER NEXT TO IT. IF IT NEED A KIDS SMALL AND ONE KIDS LARGE, WHICH OPTION DO I CHOOSE." For a 3 year old the small size. It will probably be a little large depending on your 3 year olds size. You can only get a small. "In the options how do you pick the correct size as it is M-a,b,c,etc.? He is a medium so do I choose M-M?" "My son Luke is 12 & he wears a size 16-18. Regular build. Would the large fit him well enough?" As noted in the sellers' guide to size. The large will fit 10-12. Consider the adult robes for a16-18. Good luck. Beautiful robes. Because I know a Sweet Kid Named Owen. Bathrobes for all of my grandchildren this year. My 9 year old son loves the color and was won over by his initial being able to be added. "I do not understand your sizing chart ( S_A to S-Z) What should I order for a 5 -year old child?" S-A in the sizing means size small with the monogram letter A giving you the option to order any letter of the alphabet in the three available sizes of Small, Medium or Large. To be honest, it messed me up too when I saw that, LOL! !